Japan Information and Culture Center (JICC), Embassy of Japan in the Philippines is having a singing contest for all those anime enthusiasts who loves singing their favorite anime songs. All jpop/jrock fanatics can finally show off their love to their idols in front of a live audience. 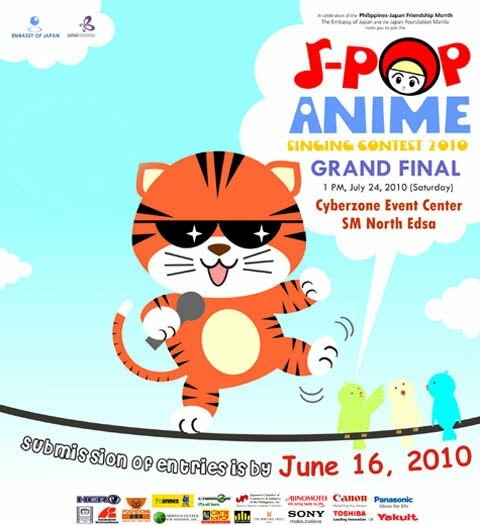 The Grand Finals is on July 24, 2010 and the contestants will get the chance to win scholarships from Nihongo Center Foundation and Center for Pop Music Philippines and be awarded with exciting prizes from event partners namely: Ajinomoto, Canon, Heritage Hotel, Panasonic, Sony, Toshiba and Yakult. Participants can also enjoy special courtesy treats of Yoshinoya. Groups can personally deliver or send via courier their application forms to the Japan Information and Culture Center (JICC), Embassy of Japan, 2627 Roxas Boulevard, Pasay City . Groups can also send their application form at jicc-mnl@ma.mofa.go.jp.